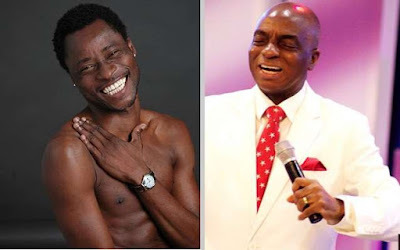 Popular Nigerian gay man, Bisi Alimi, has always been one to hug controversies, especially when it comes to issues of religion, as he has, on different occasions, taken on men of God in the country. On many occasions, Alimi, the first known Nigerian to come out in the public to declare his sexual orientation, has taken up issues with the likes of Bishop David Oyedepo, Pastor Enoch Adeboye, Prophet TB Joshua and Pastor Chris Oyakhilome, saying they are reaping off their members. This time around, he has come for Bishop Oyedepo, saying he is practicing a stupid pastoral marketing that keeps religious people in perpetual poverty. Alimi was reacting to a sermon Bishop Oyedepo gave on the issue of tithes and getting blessings from God. "Everybody believes that God has an open heaven order of blessings for his people. But you see, it takes your tithing to qualify for it. So if you only know the promise and don't know the conditions, you will die frustrated. Christ has redeemed us from the curse of sin, of poverty, of death, but what does it take to get there? It takes faith in the demands. People just believe the promise but you also need to believe the demands. It is believing the demands that entitles you to the fulfillment of the promise." "There is no provision in the scriptures without a condition attached. Even salvation, as free as it is, you need to repent before you can be saved. There is nothing provided without conditions to meet."